US Marine Corps Major Eric Burkett, his wife Melissa, and their six children. 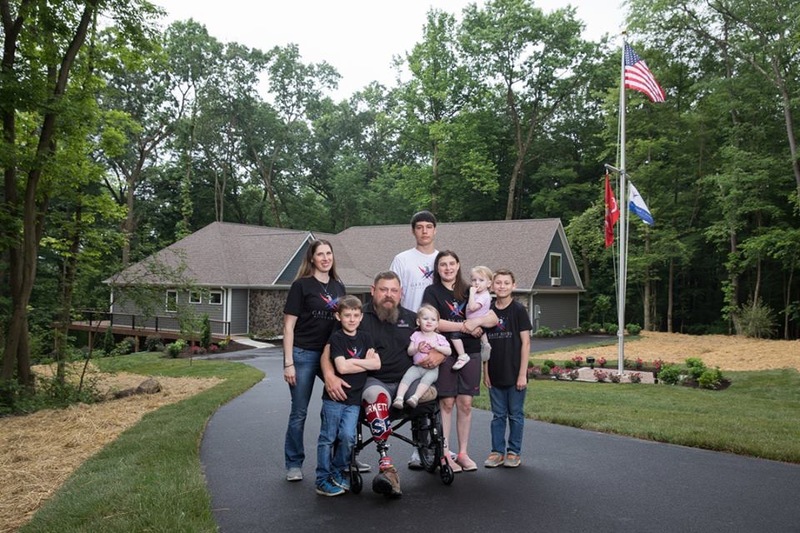 The National Wood Flooring Association (NWFA) has provided flooring for its 30th home in partnership with the Gary Sinise Foundation R.I.S.E. program (Restoring Independence Supporting Empowerment). The R.I.S.E. program builds custom, specially adapted smart homes for severely wounded veterans and first responders. The home dedication for US Marine Corps Major Eric Burkett (Ret.) took place on June 14, in New Castle, Pennsylvania. Flooring for the project was donated by NWFA member Sheoga Hardwood Flooring. Major Burkett enlisted in the Army Reserve at age 22 while attending college, earning the rank of Sergeant. Six years later, he earned a commission in the Marine Corps and went on to be an Assault Pilot. In April 2012, two weeks into his sixth deployment, Major Burkett was flying an MV-22B as part of Operation African Lion. The plane suddenly went into an uncontrolled flight and crashed in Morocco. He suffered major lower limb, lung, and ocular nerve damage. His injuries eventually resulted in amputations of both legs. In addition to the 30 homes already completed, NWFA currently is working with its members to source wood flooring for 20 additional R.I.S.E. homes in various stages of planning and construction. Currently, 55 NWFA member companies have donated product, logistics, and installation services in locations throughout the United States, with a total value of more than $4.0 million. A list of all NWFA R.I.S.E. partners is listed here. By the end of this year, 65 specially adapted smart homes will be completed or underway through the Gary Sinise Foundation R.I.S.E. program. To learn more about the program, and how you and/or your company can get involved, contact the NWFA at (800) 422-4556, or e-mail them at anita.howard@nwfa.org.